Antique Japanese Fukagawa Miniature Vase. An Antique Japanese Fukagawa Porcelain Vase. A fine quality and truly beautiful hand painted antique Japanese miniature vase. This vase stands on a simple circular foot. Although base markings have been rubbed the vase is undoubtably the work of the Fukagawa Seiji company from C. The vase mirrors the design of another currently listed. The conical vase is beautifully hand painted with two panels. One showing silver koi, the other colourful water irises. These are set against a cobalt blue ground with gold gilding. 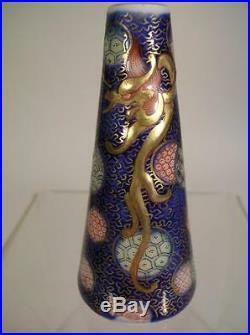 The reverse of the vase shows a firey golden dragon. The dragon is painted thickly in relief from the vase surface. Colourful enamel roundels with geometric patterns finish the decorations. Dimensions: The vase stands 8cm tall. The vase is clean and free from any cracks or chips or repairs. We respectfully ask all recipients to carefully inspect the package and contents prior to providing signature. Please refer to our T's & C's. NB: All items will be packed and sent ASAP but if you have a particular deadline for receipt of an item please let us know at point of sale to allow us to help ensure prompt dispatch. We also accept cheques but they must be cleared before any items will be sent. We do our best to ensure that all items are well packaged to ensure their safe arrival. If you have any additional packaging or postal requirements we are always happy to accomodate. If you need an item particularly quickly e.
G for a birthday present then please let us know straight away and we will dispatch as a priority. Some items may be automatically be excluded due to weight, fragility etc. We always ensure that delicate items are packed carefully and thoroughly to ensure a safe journey, we use new, professional packaging materials bought specifically for the job. Our main priority is that items arrive undamaged. Please bear in mind when leaving feedback that postal prices have recently increased considerably and that delicate items need a huge amount of packaging materials to ensure a safe arrival. We always endeavour to describe every item as accurately as possible, including any significant imperfections. This particularly relates to wooden and metal objects that develop natural patinations and marks from use. Although collectors ourselves, we do not profess to be experts in all areas and therefore always welcome any advice or guidance on any listing. We are always available to help with any queries you may have. We are available 7 days a week and will answer any questions as soon as possible. Get Supersized Images & Free Image Hosting. The item "Antique Japanese Fukagawa Miniature Vase. (995)" is in sale since Wednesday, June 28, 2017. This item is in the category "Antiques\Asian/Oriental Antiques\Japanese\Vases". The seller is "huruantiquesandcollectables" and is located in EDINBURGH. This item can be shipped worldwide.